Arnold Chiari I Syndrome, Idiopathic Syringomyelia and Idiopathic Scoliosis, amongst others, share a common cause - an overly tense Filum terminale. Have a look at our informative posts to learn about this new concept. Welcome to our blog! Today, 28 February 2019, the 12th edition of Rare Disease Day is celebrated worldwide. This year’s theme revolves around “bridging health and social care”. · Helps to find information on the rights of all EU citizens to access cross border quality healthcare. The spirit of this year’s Rare Disease Day calls on this same social-health care focus. It aims at promoting collaboration and interconnection between medical and social services, in order to build networks, programmes and projects to better assist “rare” patients and their families. A better understanding of the disease in all its aspects and a greater presence in the territory of residence can provide patients with solutions that help manage their condition and possibly improve it. The Institut Chiari and the AI.SAC.SI.SCO Onlus International Association join forces to improve the quality of life of patients and announce the recent signing of a collaboration agreement. The Association membership allows access to special conditions in the services provided by the Institute to its patients. Both the ICSEB and AI.SAC.SI.SCO wish that this initiative can contribute to a better future for Filum Disease patients and hope that their “rare” condition will find understanding and support among social, medical and research professionals. Celebrate Rare Disease Day with us! Preferred contact languages: French and Italian. We are grateful to share yet another patient story with you today. ICSEB patient Elizabeth from Philadelphia tells us how for a long time she was receiving diagnoses related to anxiety, depression and fibromyalgia before being diagnosed with Syringomyelia in 2015. Hear more from her in this video, where she explains how she found the Institut Chiari & Syringomyelia & Scoliosis of Barcelona and how the treatment helped her situation. Our first post in the new year recaps some bullet points on the Arnold-Chiari Syndrome Type I, which is often referred to as Chiari malformation. This patient travelled from the United States of America to Spain for treatment at the Institut Chiari & Siringomielia & Escoliosis de Barcelona for treatment according to the Filum System®. The minimally invasive Sectioning of the filum terminale was applied in September 2016 for her diagnosis Neuro-Cranio-Vertebral Syndrome, Filum Disease, Arnold-Chiari Syndrome Type I, idiopathic Syringomyelia and idiopathic Scoliosis. Now, a little more than two years after the procedure, she generously shares her experience with the recovery process. Thank you, Patricia! "It has been over 2 years since my surgery. I wanted to wait a long time to give feedback. This is my experience. The patient had mobility problems in her lower extremities. She didn’t have strength in her legs to stand and was using a wheelchair. Diagnosed with the Neuro-Cranio-Vertebral Syndrome. Filum disease. Descent of the Cerebellar tonsils (Arnold-Chiari Syndrome Type I). Idiopathic Syringomyelia. Multiple disk disease. Odontoid retroflexion, she went the minimally invasive procedure of the sectioning of the filum terminale according to the Filum System® at the Institut Chiari & Siringomielia & Escoliosis de Barcelona in July 2018. You can see recordings from the pre-op day, one day after the procedure and one week post-op. Dr Royo-Salvador’s theory involves the important discovery of the cause for Scoliosis, which had been considered as being “idiopathic”, as to say “without known cause”, up to the 1990ies. Thanks to his etiological explication we now know that Scoliosis can be a clinical manifestation involving an abnormal traction of the spinal cord caused by an excessively tense filum terminale; it is an expression of a Neuro-Cranio-Vertebral Syndrome and/or Filum Disease. (“Siringomielia, escoliosis y malformación de Arnold-Chiari idiopática. Etiología común”, Rev Neurol. 1996 Aug; Volume 24, Nº 132; 937 – 959 Dr Royo-Salvador MB). The “Institut Chiari & Siringomielia & Escoliosis de Barcelona” has set up blogs in some of the most widely spoken languages in the world, so that all those affected by the different diseases that make up the “Filum Disease” can gain knowlegde, information and access to the latest news, that they could be able to benefit from. 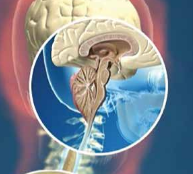 The “Filum Disease” consists, amongst others, of Arnold Chiari I Syndrome, Idiopathic Syringomyelia, Idiopathic Scoliosis, Basilar Impression or Invagination, Platybasia, Odontoid Process, Kinking or Angulation of the brain stem and nocturnal Enuresis. Institut Chiari & Siringomielia & Escoliosis de Barcelona. Awesome Inc. theme. Powered by Blogger.